In the following NY times article it becomes very clear using public space and art to foster someones connection to their environment is always a good idea. It bridges gaps between the self and community and helps people not only understand themselves in relation to a space but in their ability to transform that space for greater purposes. This is always empowering and often is part of the reason street and graffiti artists do what they do. I think it's important to take the ramifications of this article very seriously. If community use of public space is beneficial to the residents and therefore the community as a whole, why do we allow the public environment to be over run by advertising? Some say because it creates much needed revenue for the city. The percentage of city operating costs that advertising covers, much of which goes to private landlords and real estate owners who provide the wall space, is a very small amount compared to overall city budget. Not to mention the question which no one seems to ask, which is how on earth has an entire city become dependent on public advertising revenue to cover even a portion of its operating costs. Add to this that many Artists and eccentrics don't need an invitation to use the public space as a vehicle for expression, communication and ultimately as a way to understand thier personal relationship to the community. They are willing to do it for free. All the benefits of a community project sponsored by the city happening on a daily basis through individual participation. It is in fact the health of the city we are talking about here. We are weighing the revenue gained through outdoor advertising against the beneficial process of community art making and civil visual interaction. 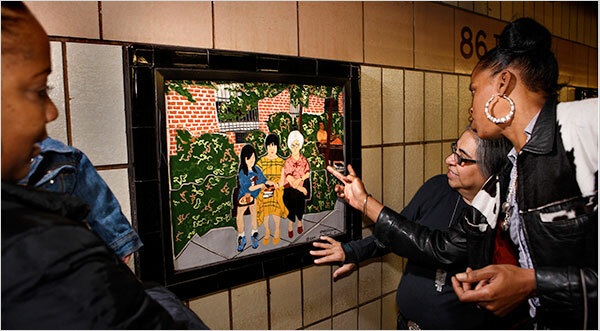 From left, Lisa Branch, Nitza Tufino and Kim Ferguson discussed one of the murals at the 86th Street subway station on the Upper West Side. When the No. 3 train roars by the 86th Street station on the Upper West Side, the dingy platform becomes the noisiest, if not the most unlikely, museum in the city. The station is the permanent home of 37 ceramic murals, mounted almost 20 years ago on the walls of the platform and mostly ignored by commuters waiting for the next train. But every now and then, commuter indifference gives way to curiosity, just long enough for someone to take in a portrait of a not-so-distant Upper West Side past. There is the mural of subway riders boarding a red No. 2 express train at the 96th Street station nearby, or the two Hasidic men pushing pink baby strollers in front of a Chinese restaurant. In another, two old people inch their way toward an M104 bus. These are no masterpieces. Most of the young people who created them were troubled or struggling students trying to earn their high school equivalency degree. Were the murals to be removed and sold, they probably would not fetch anywhere near as much as the 200 subway art projects by professional artists commissioned since 1985 by the Metropolitan Transportation Authority’s Arts for Transit program. But their value is measured in other ways, especially to the students who created them and a neighborhood that has grown accustomed to them since they were installed in August 1989. Going on 20 years later, a number of these young people look back on a community art project that left a lasting impression on their lives. For some, it was a turning point. Others say they wish they had left a more personal mark on history. “When I see it now, I see all the love that I put in that work,” said Leeama Scott, 44, who was a teenage immigrant from Trinidad when she worked on the murals. Some have left the Upper West Side, and some have fled New York City altogether. But wherever they ended up, most have become the subjects they portrayed: the office worker headed downtown, the parent playing with a son or daughter in the park, the community organizer, the teacher. Guy Monpremier, 43, came to the United States in 1985 to escape political turmoil and violence in his native Haiti. For him and others, the mural project was a chance to explore the world beyond his immediate environment. At the time, he was attending high school equivalency classes at Grosvenor Neighborhood House, a settlement house on West 105th Street. Grosvenor, an urban refuge of social service and education programs housed in a bleak rectangular structure that looks more like a compact jail, had been brought into discussions over how to spend $205,000 in amenity financing that had been promised by a developer constructing a high-rise condominium at 84th Street and Broadway. Some of the money went toward the project, which paid for materials and a $4-an-hour stipend for the 17 students who participated. Carrying 35-millimeter cameras, Mr. Monpremier and the others were dispatched throughout the two-square-mile neighborhood to capture images of landmarks and typical urban scenes. The negatives of the best scenes were then made into slides, and the images projected onto a wall, where they were traced onto paper. These drawings were transferred in reverse onto 23-by-30-inch linoleum sheets that were then stamped onto large sheets of clay. The large clay images were cut into pieces small enough to fit into kilns and fired, then painted with colored glaze, put back together like puzzle pieces, then finally mounted onto large frames. Mr. Monpremier, like a number of students involved in the project, had plans to study the arts afterward. He attended Manhattan Community College for a time, but his studies were cut short. He is now director of security for a commercial real estate firm and lives in Crown Heights, Brooklyn. His contributions to the murals include a Broadway island bench scene, one of two older people getting on the bus and a street-corner view of Grosvenor. A slight note of melancholy enters Mr. Monpremier’s voice when he recalls that period of his life. He has now invested hopes of a better future in his 10-year-old son, Joshua. Clarisa Ureña started having children when she was 19, three years after she moved out of her parents’ home. She had two by the time she got involved with the mural project. While Ms. Ureña studied for her high school equivalency exam, her children attended a day care program at Grosvenor. In the afternoons, she labored over a classic scene, the Lincoln Center fountain plaza. She lived one block away, on 106th Street, and Grosvenor had long been a part of her life. Her roles as wife, cook and mother supplanted her early interest in education, until the mural project came along. Ms. Ureña, who moved to Garner, N.C., almost four years ago, said the project motivated her to go to college. She studied computer graphics and advertising at Bronx Community College, and after having a third child in the early 1990s, she received a bachelor’s degree in art education from City College. For a brief time she taught art to elementary schoolchildren in the South Bronx. In North Carolina, she works for Wake County’s food stamps program. Mrs. Scott, then Leeama Blugh, attended equivalency classes at Grosvenor during the day and in the evening worked there as an assistant, helping younger children with their homework. She said the project had so inspired her that she thought seriously of pursuing a career in the arts. But her life took different turns. She attended beauty school and worked at various beauty salons in the city. Over the years, she has worked as a home attendant and an office worker on Wall Street. She now works in security. Mrs. Scott said she had no regrets that her dreams of becoming an artist had faded. “When I look back and see all these things that I did, it makes me feel good,” she said. Original plans for the mural project called for a less significant role for the students. A professional artist would design the work and hire students to do the manual labor, said Nitza Tufiño, 59, the artist brought in to direct the project and teach the students how to make the tiles. Ms. Tufiño, the daughter of Rafael Tufiño, a prominent Puerto Rican painter and printmaker who died last year, said she viewed the project as an instrument for social change. Having the students work on an assembly line for another artist, for $4 an hour, would have had little impact on their lives, she said. Inside her home in South Orange, N.J., Ms. Tufiño has kept dozens of black and white photographs, contact sheets, negatives and slides documenting the mural project. Many of the photos show the students in the Grosvenor workshop, a space no larger than a public school bathroom, drawing, rolling clay and carving linoleum. Twenty years ago, Sandra Bloodworth, director of the Arts for Transit program, was new to the transportation agency, and the mural project was her first assignment as a supervisor. On a recent visit to the station, with Kim Ferguson and Lisa Branch, two participants who have remained close friends to this day, Ms. Tufiño reflected on the project. Ms. Ferguson worked on the mural depicting commuters boarding the No. 2 train at 96th Street. In another mural, this one made by Ms. Branch, Ms. Ferguson is shown sitting next to two children on a brownstone stoop, wearing a yellow jumpsuit. Ms. Ferguson, 41, is now a community organizer for the New York City Mission Society’s Minisink Townhouse in Harlem. She said the work she does today is a continuation of the help given to her at a critical time in her life. Ms. Branch, 40, gave birth to her first child, Timothy, seven months ago, and until recently worked as a receptionist for Bear Stearns through a temp agency. She brought Timothy along for the station visit, dutifully covering his ears every time a train roared past. In an interview before the visit, Ms. Branch said she had recently seen the tile murals from a passing No. 2 train.